I was going to be so productive today. Really, I was. I even had a list. But then I woke up around 3:30am for no obvious reason and had a pickle of a time getting back to sleep. Somewhere around 5:30 I drifted back off (I probably should've just gotten up) just in time for my alarm to go off at 6:30 (I had set it earlier than usual as part of the whole let's-be-productive-thing and also for some quiet time first thing) (I ignored it). I didn't wake again until I heard, "Mom! My pants are too tight!!" loudly exclaimed beside my bed and rudely ripping me away from my dream at 7:45 (she has two pair of what I thought were the exact same uniform pants from Target and one pair is tighter than the other and drives her to distraction). So much for trying to have an unrushed, calm morning (at least for today). 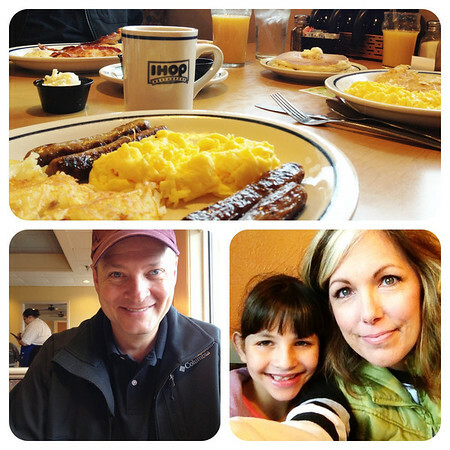 In other news, we kicked off the weekend with one of our semi-regular visits to IHOP. Breakfast out is our fave. But you already knew that. 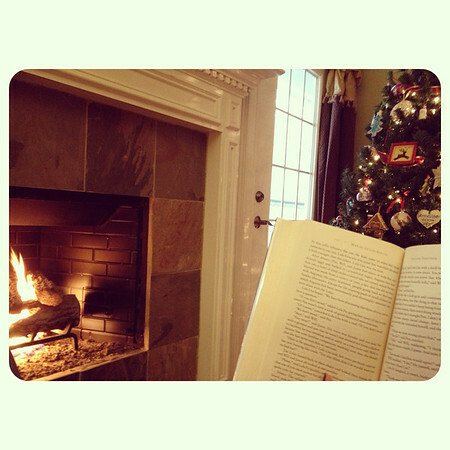 Saturday was rainy and cold so this was the perfect place for me to spend the majority of the afternoon. Delightful. Is what I'm saying. I finished reading Falling Together which is Marisa de los Santos' latest book. I hated for it to end. We ventured into new territory over the weekend. iPod touch territory, that is. Annelise had been saving her money for quite some time and she received a sweet amount of greenery from Pappo and Grandma for Christmas. 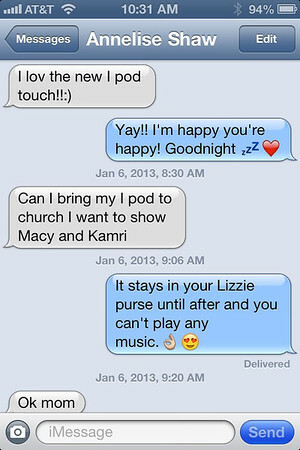 Of course Scott and I had been saying no, no no for just this side of forever to all of her desperate pleas for either a Kindle Fire or an iPod touch. I mean, honestly, we have enough technology around us with our phones, NintendoDS, computers, iPad, yada, yada. And now I feel like we've crossed into full blown TweenieTown and I want to go back. At least we need to set limits (which we will). Is 9 (almost 9 1/2) too young? Maybe. But here we are. (She's already *lost* it for two days for getting on orange for talking at school). In other, other news, I went for another run this afternoon (3 miles) which felt good. I wore my new Nikes (Lunar Glide 4s) and really like them, they're super lightweight and flexible but still I felt like I had good cushion and support. My goal (so far) is to get at least 3 shortish weekday runs in and a slightly longer run in over the weekend. No, I'm not training for anything in particular (yet), I just miss running being a regular thing for me. Of course I plan to work in strength, core/abs, TurboFire and maybe yoga here and there too (I don't have a *plan*, just picking and choosing from my Beachbody programs but trying to balance cardio with strength). I guess that's enough of my miscellany for now. What's some of your miscellany of late? 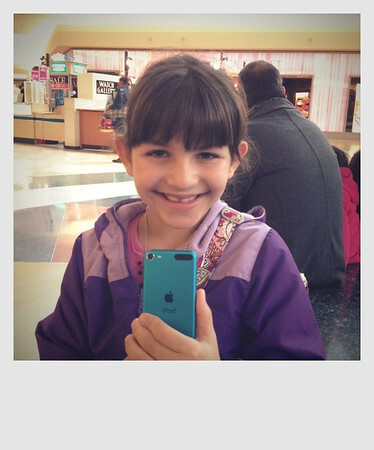 My kids gets to share my old iphone, with the data plan turned off, of course. I totally get what you're saying with all the technology. We have too much in our house. Strength with cardio will make you a better runner. I'm hoping to get to regular running again. This time out of school really threw me off my gym routine, especially with sick kids. I did get out for 3 miles Saturday and it felt good, thankfully. And the book is on my list!